I love the beginning of the year, and especially this year. It gives us all a chance to start something new and make those all important resolutions. I didn’t really make any this year, I am one of those people who make them and 8 days later I’ve forgotten all about them, and most likely picked up new habits. So this year I decided to make only the ones I can keep; cook more, eat more and love more… Simples! To start the year off, I made White wine and herb roast chicken. It is a pretty simple recipe and takes about 40 minutes (including prep time), but of course this is me, nothing is ever simple! I was making this for a lunch, and only got started at 12.30pm after a mad dash to the supermarket for chicken, and the herbs! They say that before you start cooking it is best to get all your ingredients together, and I should probably work on that, because I always seem to be dashing around the kitchen, store cupboard, or the supermarket looking for an ingredient. 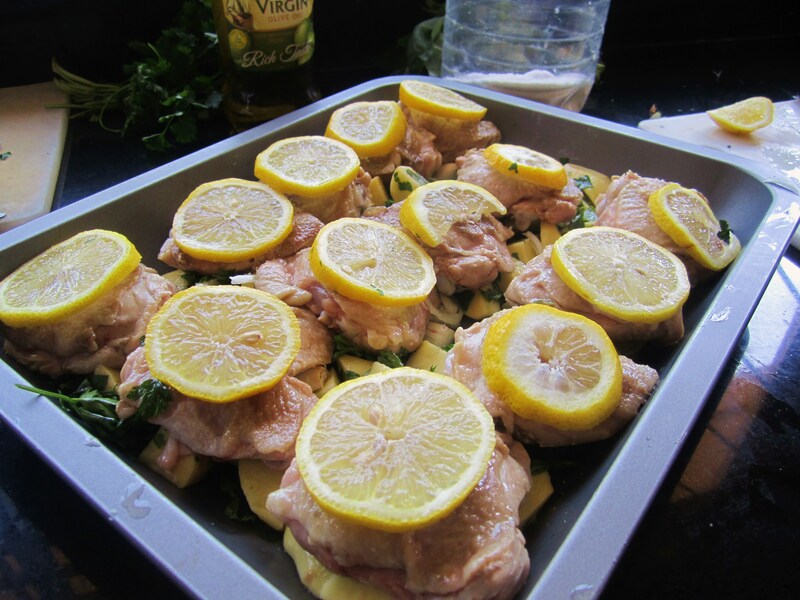 This recipe best works with chicken breast fillets, I used thigh fillets instead. I guess you could say I’m a ‘thigh kind of girl.’ For the herbs, I used flat leaf parsley, thyme and I added basil to it just because I love basil! I’m sure you can use any herbs you like; it just depends on what you prefer or have to hand. I used normal potatoes, which wasn’t such a great idea; it took forever for them to cook. Okay! I didn’t parboil them so that didn’t help much. I would definitely recommend using new potatoes; they would be much better suited for this recipe! Save for the minor setbacks I really enjoyed making this chicken! I did have my little chef helping me out… my 5year old niece (who really does call herself ‘Little Chef’) was on hand to mix and chop and make sure I didn’t leave anything out! 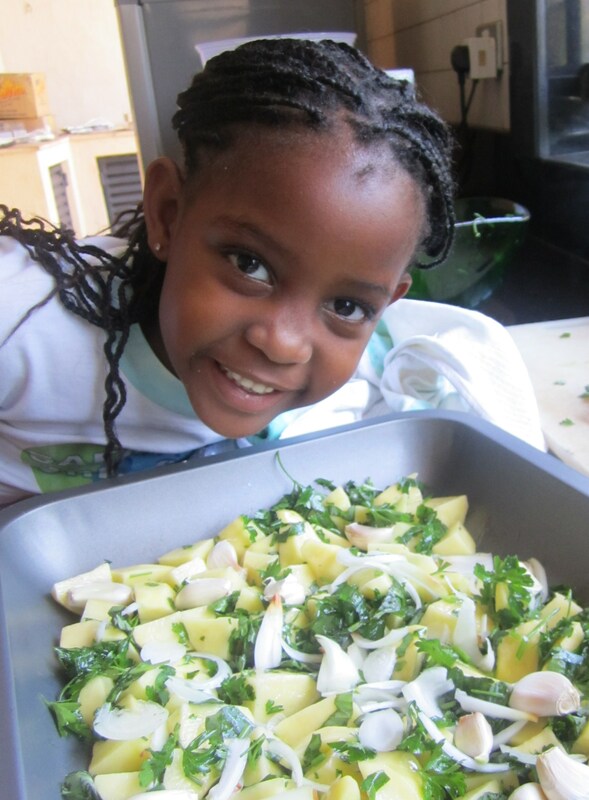 I think everyone should have a little chef in their kitchen, if not for being helpful then just for the fact it is such a joy to teach a little mind about food… it is the most precious thing! So with time not on my side and my little chef by my side I set off making lunch. Oh yeah, did I mention I was delivering this meal for lunch to my other? In town? Yes! I do love a challenge! I should mention that it is my other who has had to suffer my never ending craving for food, and also gave me the name ‘Miss Piggy’, to which I call him ‘Porky’… all coming from a place of love, of course! Anyhow, I did make it on time (ish), and made enough to feed my sisters and a hobo! My other was rather surprised that I made this, and it wasn’t disgusting! As he said “I’m impressed.” I find it fascinating when people are surprised by my cooking… But that’s just me; full of surprises. Preheat oven to 200°C. 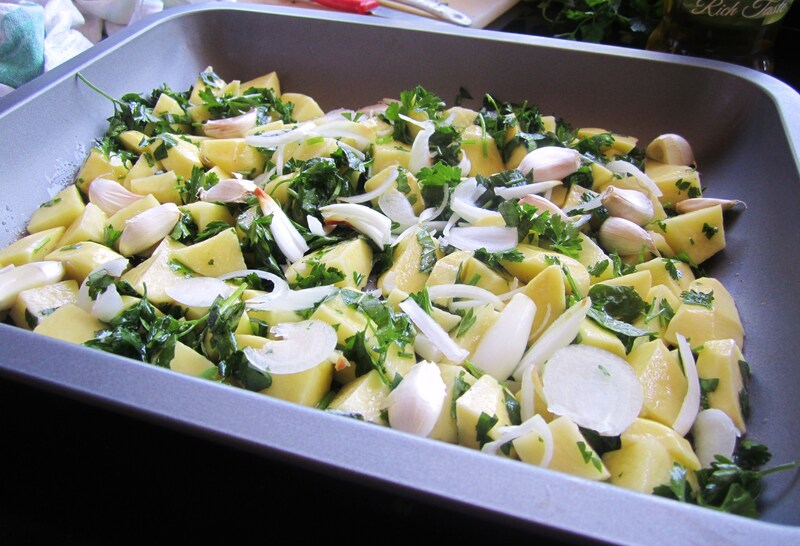 Place halved new potatoes in a roasting tin, toss with 1tbsp olive oil and season well. Add finely chopped herbs and toss with the potatoes along with the thyme, and cloves of garlic. I added a few slices of onion as well. 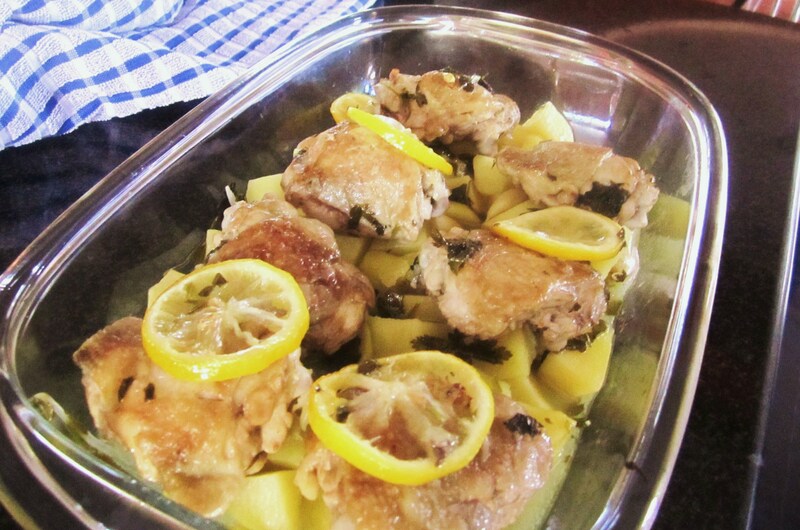 Season the chicken and place on top of the potatoes; add the lemon slices on top of the chicken. Drizzle over a little more olive oil, white wine and chicken stock, then roast for 30 minutes, or until potatoes are tender and chicken is cooked. I served this with a green salad, drizzled with olive oil and a little balsamic vinegar. I’m glad to be back in the kitchen this 2011, There will be plenty of meals, plenty of eating and most definitely plenty of love! Where did you get flat leaf parsley from? Zucchini ABC never has any 😦 and I’m not a curly fan. I consider that more for garnish or would I have to go to Village Market. I got some at Zucchini actually, but i guess it’s one of those things you have to chance upon on most days! Also Nakumatt supringly have it… You don’t like curly parsley? I like it personally, flavours are much stronger!